Erna Witoelar is best described as a force of nature. Her energy, passion, commitment to causes, her sense of justice – all compete to be heard. Her career would have exhausted most people long ago. Activist, NGO founder, environmentalist, consumer and women’s rights campaigner, government minister, fighter for social justice, a leader on national and international stages. And it was her non-academic student life that spurred her subsequent multiple career in civil society. Immediately after university, Erna began work for The Indonesian Consumers Foundation, moving swiftly to its international organization. This was indeed the only time Erna ever had just one job. 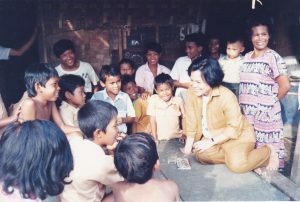 Having founded a number of still vibrant NGOs – among them The Indonesian Forum for the Environment (WALHI), Friends of the Environment Fund (DML) the Indonesian Biodiversity Foundation (KEHATI), the Clean Ciliwung River Movement (GCB), the Partnership for Governance Reform Indonesia (PGRI), and the Foundation for Local Governance Initiative (YIPD) she could be forgiven for deciding to take a rest and enjoy travelling with her family or just spending time together. Predictably, she didn’t. Erna takes up the story. “In 2003, Kofi Annan asked me, through his head of The Millennium Campaign Eveline Herfkens, to become the Asia-Pacific Special Ambassador for the UN Millennium Development Goals, a role I continued until 2007. This deepened yet further my understanding of the global-local interconnectedness of sustainability.” Overlapping with this by a year (unsurprisingly), she also became a member of the UN Commission on Legal Empowerment of the Poor, until 2009.